We all love our appliances, but whether it’s frozen, old or damaged, at some point your fridge, dishwasher, washing machine, water heater or basic plumbing will go out. It could be a puddle, as if the fixture were crying about its condition, all the way to a full on tantrum, flooding rooms and causing severe damage. So how can you increase your odds against a house or building full of water? A property manager or homeowner can do a lot to prevent water issues by knowing the current condition of their appliances, fixtures and piping, and knowing who they can call and depend on to get the job done quickly and effectively when something does happen. By replacing key heavy use items such as water heaters and water lines proactively, you can avoid some risk. You probably do that today. 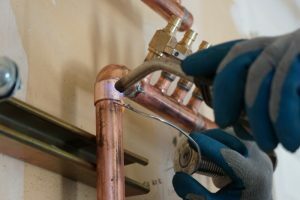 What is new is that water emergencies and potential damage can be greatly reduced by applying new technology – a unique water leak protection and notification system called Plumber’s Choice. Sounds big but it’s a small device that can detect a leak, shut off your water and notify you by email. Plumber’s Choice is manufactured by QMI, of Vancouver, BC, Canada. They’ve been making these products for years under the name Water Guardian, and now it’s available in the US. As soon as your water heater starts leaking, this product will sense the water, automatically shut it off and an audible alarm would sound. These systems can be installed for your dishwasher, water heater, washing machine, furnace, and plumbing fixtures. You name it they have it covered. They remotely shut off your main water or just your appliance water, depending on how you set it up. The device then wirelessly sends the homeowner, property manager or even a contractor an email message so you can react as quickly as possible and snub out any water damage. The water leak protection system can benefit single family homes, but is an even greater value to apartment buildings and condominiums where one leak could affect multiple residences and property managers may not be on site. One of our customers told us this true story. She was a tenant on the 18th floor of an apartment building. At 2am the phone rang and it was the front desk in the lobby. Water was coming out into the lobby and did she have a leak? The surprised tenant stepped out of her bed onto a soaking carpet and quickly they summoned the manager on call. Her dishwasher was stuck mid-cycle and in just a few hours, water ran through every single apartment in the line below for all 18 floors before hitting the lobby. The tenant had no liability, as it was the building’s equipment and not user error. As you might guess, the rest of the story involved repairs and claims throughout the building. This could have been completely mitigated by the Plumber’s Choice products. Washington Energy Services is the local representative for Plumber’s Choice and qualified to install these systems. For more information on multi-family applications contact Account Manager, Tyler Heagle at 425 766 2319. For single family home installations, please call our service center at 800-398-4663. I am installing 2 40 gallon hot water heaters and am leaving house empty for a month. I am shutting off water to the house. But if tank leaks I want to notify my plumber to avoid the entire 40 gallons leaking out. I want to be emailed ASAP upon first detection of the leak. Does your product do that? Sorry for the late response, we couldn’t log in to the site to see your not until now. Yes, the Plumbers Choice water leak protection product can send an email to whoever you choose for notification upon detecting a leak. 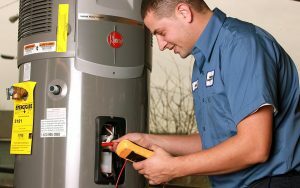 If you would like to get one installed, please call our plumbers at 800 590 4969.